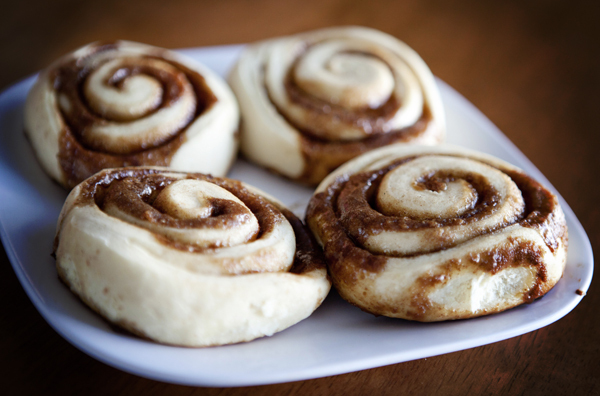 Here’s an excellent cinnamon roll recipe I posted a few months ago and just dug around the site for the recipe so we could make it again. They are an excellent motivator for kids to finish a dinner they don’t love. Works every time. 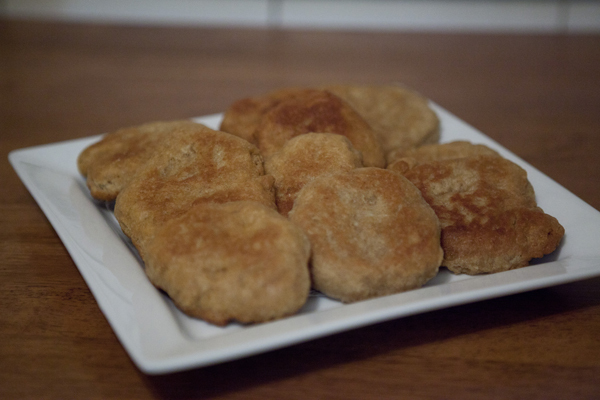 I got this recipe from the all recipes site, and tweaked it to make it vegan and egg-free. For your egg substitute mix 1 1/2 Tbsp Flax with 2 Tbsp water in a cup until it has an egg-like consistency. Then add it to the rest of the ingredients in the breadmaker. Add the pudding mix to the breadmaker, plus a tsp vanilla. Let it mix and rise. Once the dough has risen, roll it out onto a clean surface making a long rectangle. Then spread the filling on, and roll the long side up along the short side. Cut about 1 1/2 inch pieces and smash them on a cookie sheet lined with parchment paper. Cook at 350 degrees for 15-20 minutes. 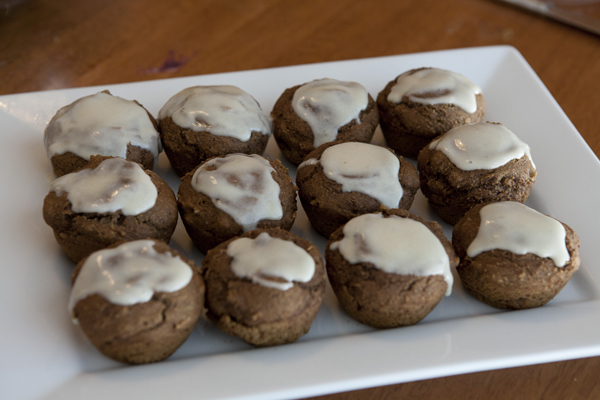 These were so delicious warm and gooey, we didn’t even add the frosting the recipe calls for on top. One day I was craving some serious junk food, so I made up this vegan scone recipe by tweaking another recipe and it was amazing! Mix everything together with a dough hook. Then place in an oven warmed to 120 degrees and turned off. Heat olive oil in a sauce pan at medium/low heat. When it starts to sizzle, take the dough by handfuls and smash into a small pancake. Fry in the oil about 3 minutes per side. Yum! I had a large can of pumpkin and only used half of it for this pumpkin cheesecake recipe, I had to do something else with the rest of it (and had leftover vegan cream cheese also) So we tried this pumpkin bread recipe, and I put them in muffin tins instead of a bread pan. Bake in the oven at 350 degrees for 1 hour. Then prepare cream cheese frosting. Mix together and drizzle on top of the pumpkin bread! The first thing I did was prepare the vegan cream cheese from this website in a separate container. 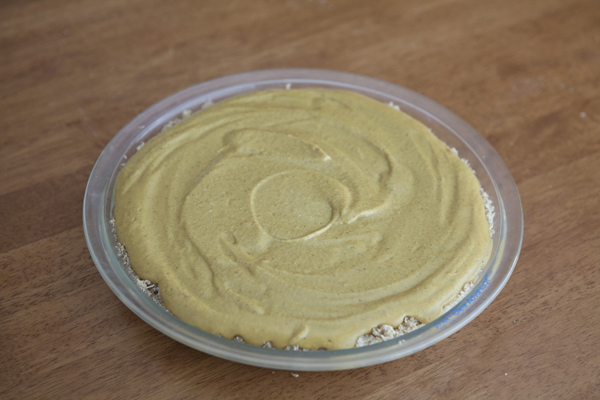 Prepare graham cracker crust by mashing 2 cups whole grain cereal in a zip-lock bag, and then mix in 2 tbsp honey and smash into a pie dish. Then add the filling from the blender and bake at 350 degrees for 45 minutes. Cool to room temperature and keep in fridge for several hours before enjoying! 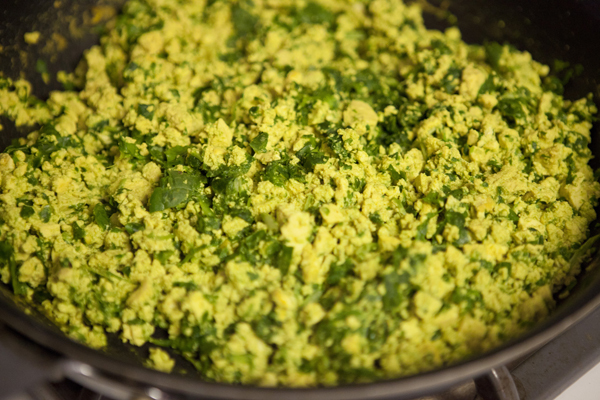 A fun dish we tried last week was this tofu scramble from the Happy Herbivore recipe book. I fed this to my meat-loving niece who was staying at our house and she loved it! Crumble tofu and add all ingredients to a saucepan.